Lets not rest when it comes to the "minnows". This week on the Reverse Stick we spoke to the Secretary of the Trinidad and Tobago Hockey Board, Rheya Richardson. It is a small country, with a population of around 1.3 million. According to Ms Richardson there is a pool of about 500 players, men, women and juniors. There is one turf and their ‘A’ grade competition still plays some games on grass. Yet despite this Trinidad and Tobago is currently ranked #35 in the world. This is an outstanding achievement for all who have made it possible, players, coaches, administrators and the supporters of Hockey in this tiny democracy. You are all obviously doing something right. We are sure the Trinidad and Tobago Hockey Board has hopes that ranking can rise, and with their continued hard work and dedication there is no reason to think it won’t. But they, like many other of the so called minnows, will need the support of the wider Hockey community to help provide opportunities for players, coaches and administrators. And when we say ‘support of the wider Hockey community’ we mean ‘FIH’. That is not to say the FIH should just throw handfuls of money around, but to continue to impliment and refine pathways for minnow nations to compete at international level. 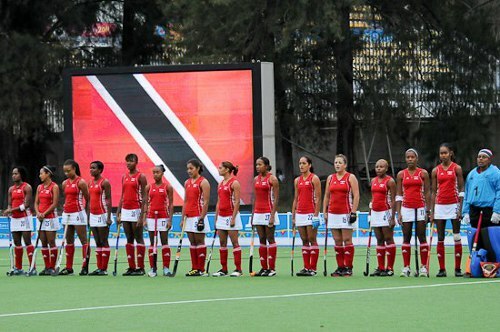 The FIH should look upon Trinidad and Tobago’s success with some sense of pride. However they need to provide continued support and now is not the time to be doing any backslapping. And as remote as it may seem, Trinidad and Tobago at a World Cup would be an achievement the whole Hockey community could celebrate.